Where do all of those bulky items get put when you’re not sure if you really want to get rid of them just yet, but you are trying to free up space inside your house? Unless you have a basement, most people end up storing these items in their garage. Your Christmas and Halloween decorations have to go somewhere. Some of these items are seasonal, so they will get used again. But over time, the majority of those unwanted items you’re putting out in your garage are things you will most likely never use again. It’s one thing to have a junk drawer in your house, but when you’ve got a completely full junk garage you end up running out of space to park your cars. So what do you do when removing all these unwanted items becomes way too much of a task? They won’t just disappear on their own, so now you have to make a decision. Find a way to haul off all of this junk and unwanted items in your garage yourself, or call Dog Gone Junk for unwanted items pickup in Springfield Missouri. 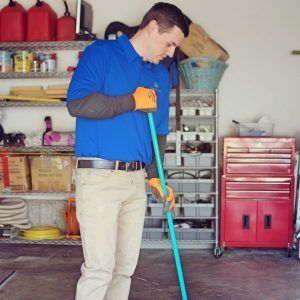 Not only will we clean out your entire garage or shed, we will sweep up or Shop-Vac when we are done, leaving you with a freshly cleaned space. We can haul away all of your unwanted items from appliances, to electronics, furniture, tires, mattresses, and much, much more. No amount too small, no item too big. Call us and we will get it all out of there for you. Our professionally trained team can help you get organized like you’ve been wanting for a long time. The best way to get organized is to remove all these unnecessary items from your life. Call Dog Gone Junk for a free estimate and let us do all the sorting, loading, hauling, donating, recycling and proper disposal. Let us clean out and get rid of all that clutter so you can finally use your garage what it was originally intended for and actually park your vehicles in it.